I love sushi. I would eat it everyday if I wasn't so lazy! Most favorite sushi rolls are avocado cucumber rolls. 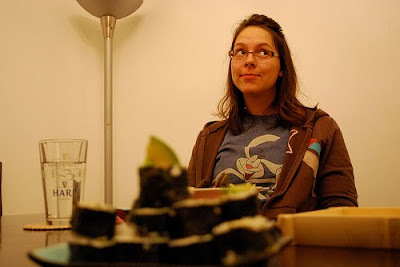 And when I have tempeh and carrots, those get tossed into my sushi too. Why not! What can I say? Carrot-cucumber-avocado-tempeh rolls! So, I'm kinda boring. and pretty lazy. Speaking of lazy, have you checked out the laziest vegans in the world blog? Yeah, you should do that! 1. Get a rice cooker. Seriously, it will make life easier. Plus, you are probably super efficient, right? You want to chop and not have to babysit the boiling water on the stove! In the rice cooker, for quinoa and most rice, I do a 2:1 ratio of water to rice. 2 cups of water per 1 cup of rice. Sushi rice is no different. Get that rice cooking! It is the rate-limiting-step! 2. Cut all ingredients that are going into your rolls into thin strips. For me, it is usually sauteed tempeh, carrots, cauliflower, and avocados. 3. Make a thick creamy sauce for the inside the rolls. I use a couple of spoonfuls of vegenaise and a small spoonful of thai chili sauce. If you like some spice to your sushi, go ahead and add your favorite hot sauce. I have a farmer's palate, so I keep things boring, unspicy, and uncomplicated. 4. Once that rice is done cooking, add a couple of splashes of white rice vinegar and a pinch or two of sugar and mix that all up. 5. Set up your assembly line: a bowl of water for your fingers, bowl of rice, sheets of nori, your thinly sliced fillings, and that amazing creamy sauce. Also grab a really sharp knife. 6. With dry hands, lay your nori sheet on a dry cutting board or plate. Dip your fingers into the bowl of water, then grab a handful of rice. Fill 2/3 to 3/4 of the nori sheet with a thin layer of rice. 7. In the middle of that rice, add the creamy sauce and filings. 8. Begin rolling up the sheet as tightly as possible, starting on the side of the nori sheet full of rice. 9. When you get to end of the paper, re-dip your finger into the bowl of water and dampen the edge of the nori sheet. This is going to help "glue" the nori together. 10. Place the seam facing down on the cutting board. 11. Dampen your really sharp knife with the water. 13. Serve with a small bowl of soy sauce. Enjoy! Thanks John! I'm really trying to get into the MoFo this year...I'm glad to see you're still supporting Amy and her amazing food!